Category flat tax functionality is available to users with version 18.1.107 and is not enabled by default. If you're on an eligible version, use the instructions below to get started. Multi-store retailers: If you share tax rates between locations, category flat taxes must be configured at your primary location and are shared in the nightly Data Exchange. Please note that Category Flat Taxes cannot be edited by line item within a sale transaction. To exclude individual customers, edit their Customer Record by applying a Tax Exception. The instructions below are meant only as a guide - please consult your tax specialist for up-to-date state and federal law requirements. 1. 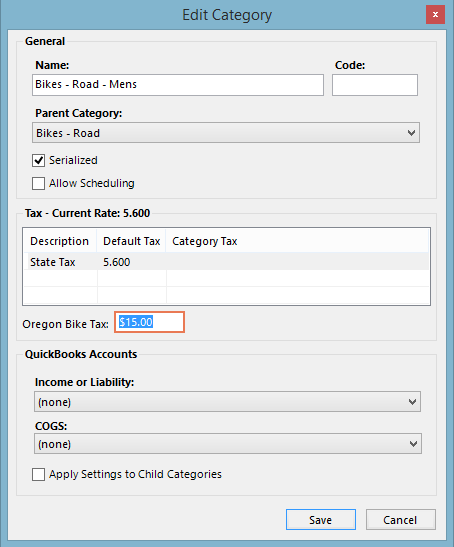 Double-click on the unhidden CategoryFlatTax type to edit tax Amount, Description, mapped QuickBooks account, and Tax Items. Sherpa tip: Oregon retailer? Set the Tax Type Amount to $0.00 and update the Category Tax field (next section) on all applicable bike categories to $15.00 for the bicycle excise tax starting January 1st, 2018. 2. Click Save to record your changes or Cancel to close the window without saving changes. 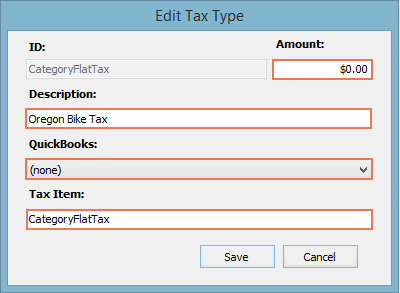 Sherpa tip: Category flat taxes must be set individually, by category. Flat tax rates will not be applied to any other category (including child categories) automatically. 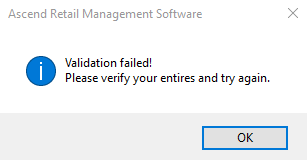 Getting a Validation Failed! error message when attempting to save an unmodified Tax Type like the one below? Don't worry! Simply click Cancel on the Edit Tax Type window to proceed. The default settings will be used and your Tax Type will be ready for use.